This recipe makes a 10-by-6-inch slab of bark. Line a large flat dish or baking tin (about 10 by 8 inches) with a piece of aluminum foil or parchment paper. Put the chocolate and cardamom seeds in a heatproof bowl set over a pan of simmering water. When the chocolate has melted, stir in half the fruit and pistachios. Spread the mixture over the foil or paper in a thin sheet, then press the remaining fruits and nuts lightly into the warm chocolate. Sprinkle lightly with the salt. Refrigerate until the bark has set, about an hour. To serve, break the bark into pieces. Store any extra bark in the refrigerator in a covered container or waxed-paper bag. It will keep well for a few weeks, if it lasts that long. Culinate editor's note: Don't have the exact nuts or fruit called for? 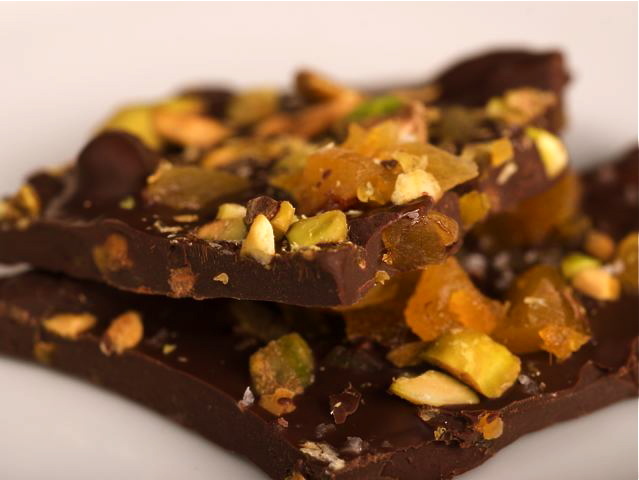 Try other fruit-and-nut combos, such as the trio used by Oregon chocolatier Petits Noirs for their mendiants, or "beggars": dark chocolate decorated with whole pistachios, diced Calmyrna figs, and fennel seeds.